When someone asks me what I love about Berlin my answer is nearly always the same, “It’s cheap”. For the price of one minimalist dinner in London, I can go out to eat in Berlin for an entire week with money left over for a Club Mate from the Späti. That being said, eating out can start to add up. When you’re working full-time, cooking is the last thing on your mind so you either order in or go out to eat, both expensive in the long-run. 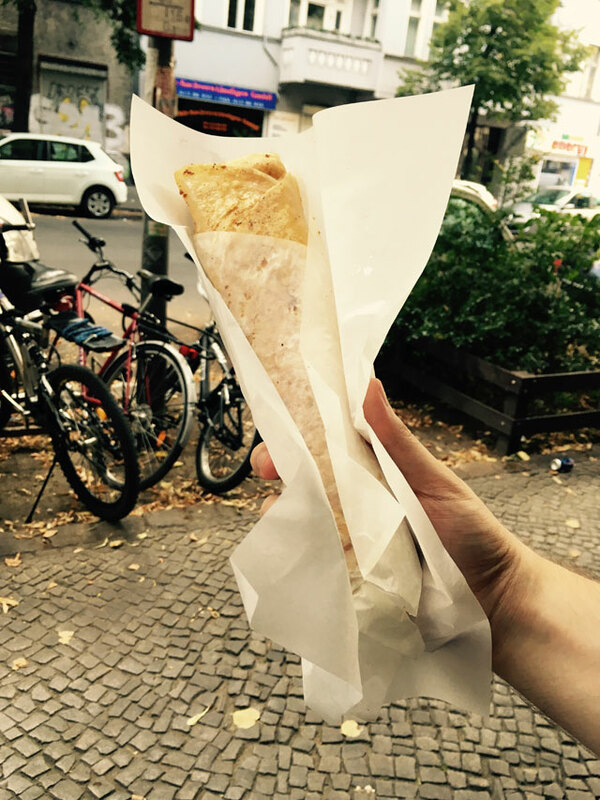 Well, dear readers, I’m here to tell you that there is an even cheaper alternative to the same-old €3 Döner you’ve been taking home, but it’ll involve a trip to Sonnenallee—wait, don’t stop reading! It’ll be worth it I promise. 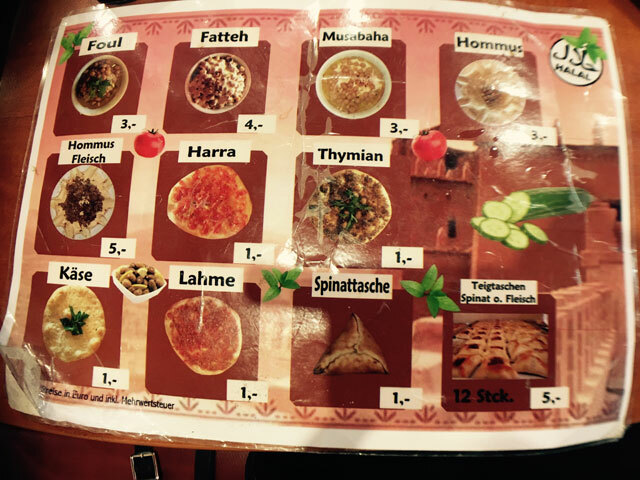 Sonnenallee isn’t where most people go for a typical Berlin-style good time, but I guarantee that when it comes to authentic Middle Eastern food this is where you want to be. I made it my mission to find the best eats on Sonnenallee for less than €4, and for the sake of investigative journalism, I accepted the task. I’m expecting my Pulitzer any day now. 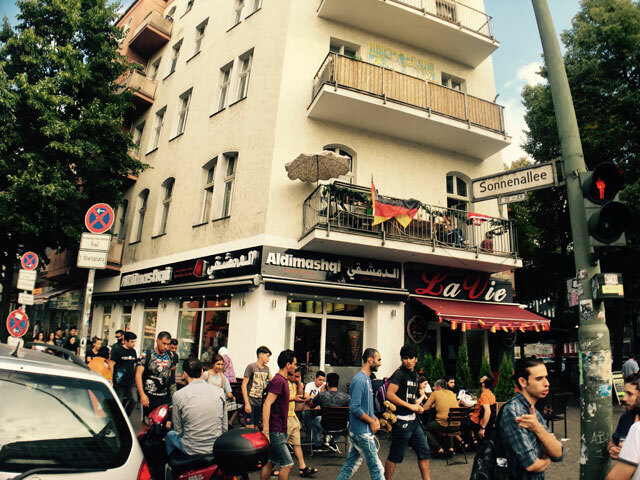 For this article, I have chosen four places on Sonnenallee that serve a wide variety of food and are frequented by locals. I’ve included vegetarian, vegan and meat foods as well as sweets. First up is Restaurant Al Daia. 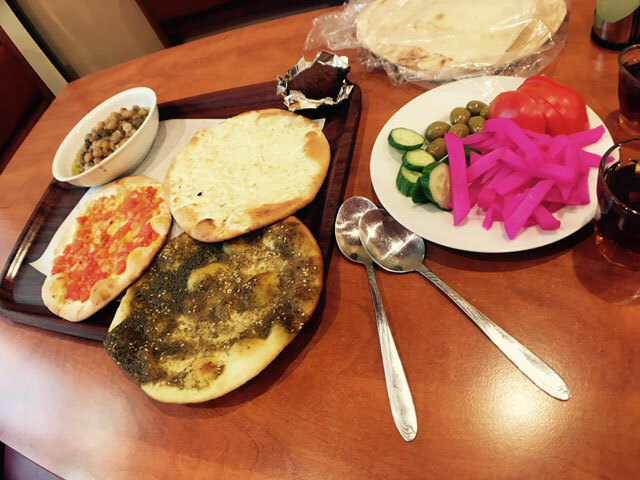 Serving up the most recognizable Middle Eastern cuisine, I chose Al Daia because of their breakfast/brunch choices. Traditionally in the Levant, breakfast is a quick sandwich wrap on a weekday or a hearty social affair on a weekend. Al Daia specializes in the latter. To start we ordered musabaha, a dish of warmed chickpeas with hummus drizzled with olive oil, manaqesh, flatbread topped with zaatar (thyme mixed with herbs), cheese and tomato and pepper (individually) and for good measure we ordered a kibbeh ball, a meat-stuffed ball made of bulgur, minced onions, and other spices. Tea is free and you can refill anytime you want. The flatbread and the dish of fresh vegetable and pickles are also free. At €1 per kibbeh ball, it could have been better; it wasn’t the tastiest thing we ordered. For starters, the exterior didn’t have the typical kibbeh crunch, and the meat stuffing inside was a little dry. The manaqesh, to me, are the stars of the show. €1 each, they come with a variety of different toppings as previously mentioned—the best are cheese, thyme, and harra (the tomato and pepper topped one). Soft oven-baked dough, made even more delectable by the warm toppings, is further complemented by the pickles you can have on the side. Filling to the last bite, get two if you’re feeling super hungry with a nice cup of tea and you’re set until lunch time. Lastly, the musabaha: such dishes are usually eaten alone with pickles on the side. A hearty dish that can put you in a food-related coma, it takes an empty stomach and dedication to tackle this beast. 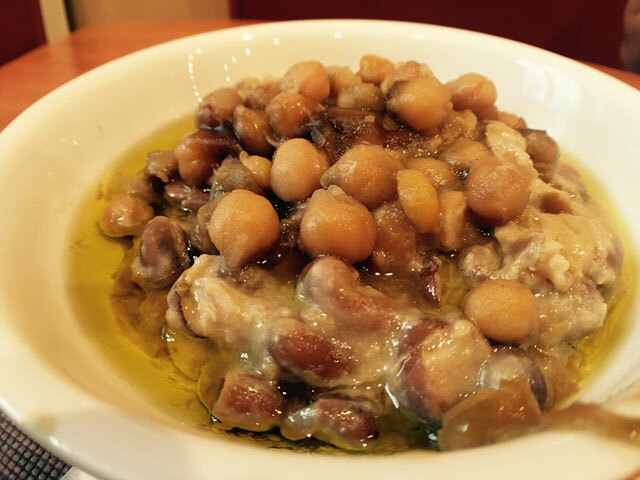 This particular version of musabah didn’t come with tahini—I recommend ordering the dish with tahini as it’ll offset the sweetness of the chickpeas. A bowl of musabaha costs €3 and you get all your money’s worth. 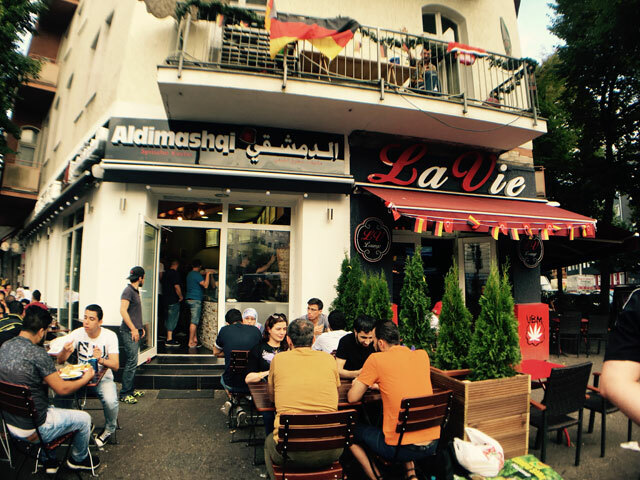 Next on the Sonnenallee food tour was Restaurant Al-Rahme. If you’re strapped for cash and start getting those embarrassing stomach rumbles, then this is the place you want to go. 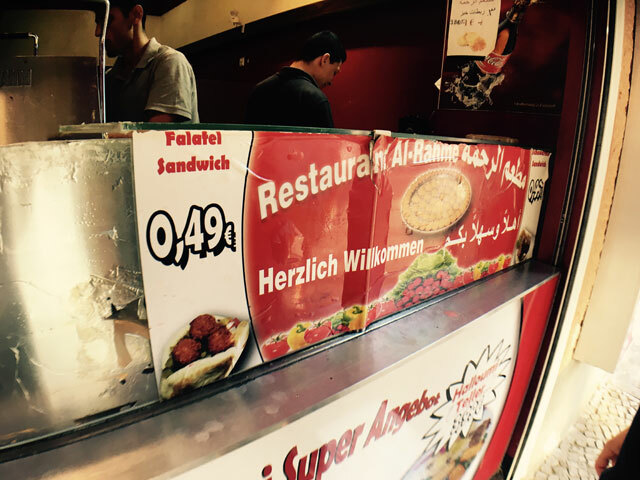 A falafel sandwich will cost you … wait for it … €0.49. The place won’t be getting a Michelin star anytime soon, but when you see the queue snaking beyond the bus stop you’ll see that people actually like the sandwiches in demand here. For €0.99 you can get yourself a pretty respectable shawarma sandwich. Feeling peckish? Get two sandwiches for less than €1.50, I won’t judge, I encourage it even! The falafel was robust and crispy—they fry it while you’re waiting at the window and make all sandwiches to order. Nice and juicy, the chicken in the shawarma was very flavorful but missing essentials like pickles and garlic cream. But for a basic sandwich on the go, it does the job. The restaurant offers platters for less than €5, and judging by the crowds inside they’re not bad at all. It almost made me feel bad for the empty Bio Company store across the road. Up next, another shawarma sandwich but this time at newly opened Aldimashqi. You’ll recognize it by the masses of people gathered on the corner waiting for their orders. The reason we wanted to try another shawarma was two-fold: 1) price and 2) taste. Let me explain. The shawarma at Aldimashqi is €3.50, which is not unusual but compared to a €0.50 sandwich, a lot higher. This particular sandwich is special because it’s made Syrian-style. Whereas most sandwiches consist of the flatbread only, Syrian-style shawarma is made by pressing the flatbread onto the meat-spit then grilling the bread after assembling the sandwich. This adds a nice crunch to the bread that isn’t found anywhere else in the Middle East. This is a sandwich for shawarma purists, filled only with meat (chicken or lamb), garlic cream and sour pickles. This crumbly sensation is an explosion of authentic flavors that take me back home. The wait at Aldimashqi on a Saturday is epic, around 30 minutes for the sandwich, and possibly longer for full platters. Aldimashqi is becoming popular and it’s not hard to see why. Fork out an extra €3 and you’ve got yourself an authentic shawarma—like the ones Mama used to forbid. Finally—dessert! 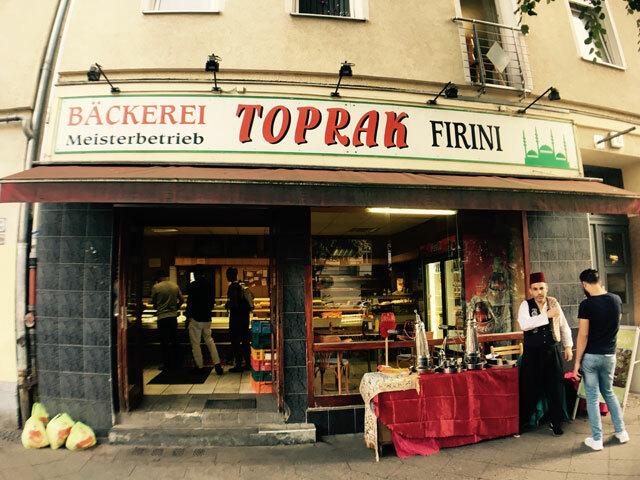 Toprak bakery is open 24-hours and makes all their sweets onsite. You can order big batches or small samples to eat on the go, but this place definitely knows quality. We opted for shaabiyat, a puff pastry filled with cream and topped with rosewater syrup. A bit bigger than a hockey puck, each piece is priced at €1. Again, a very dense dessert, shaabiyat should be eaten with a cup of Arabic coffee to appreciate the sweetness. Traditional coffee is acquired in front of the bakery for €1. 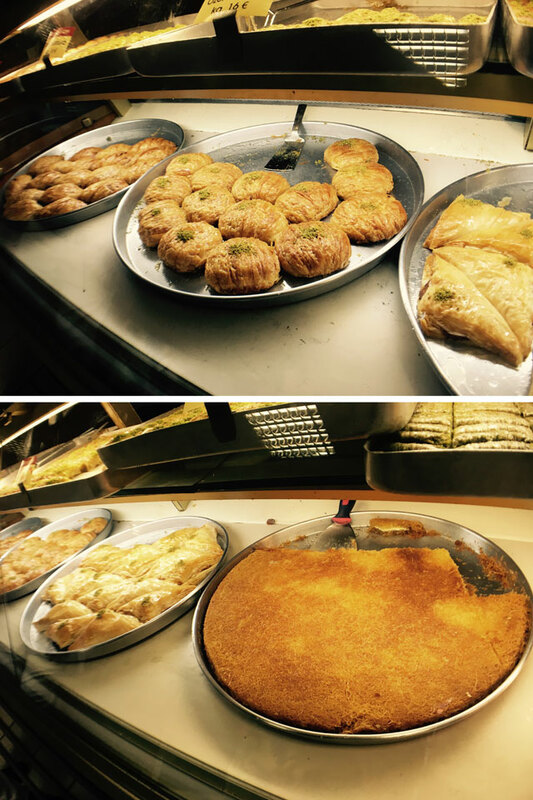 We also took a piece of kanafeh, a sweet cheese pastry soaked in syrup. 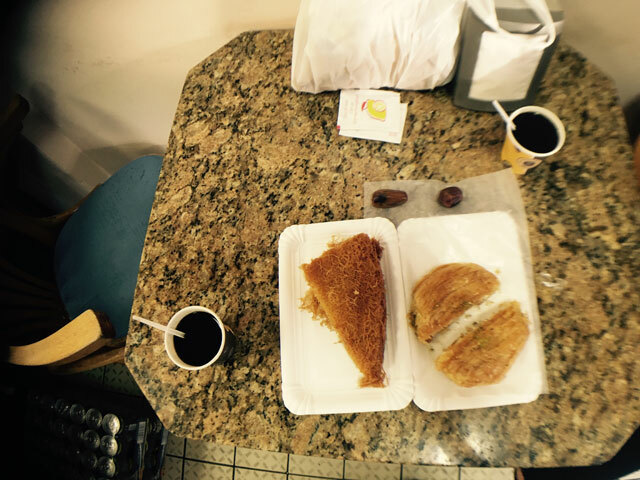 Bigger items like kanafeh can be acquired per kilo, and for a 150g piece, we paid €1.50. Best eaten warm, this kanafeh conveyed all the best attributes of the sweet: the crispy top layer, followed by the soft sweetness of the cheese all mixed with the smoothness of the syrup. It was a very fitting conclusion to the mission. 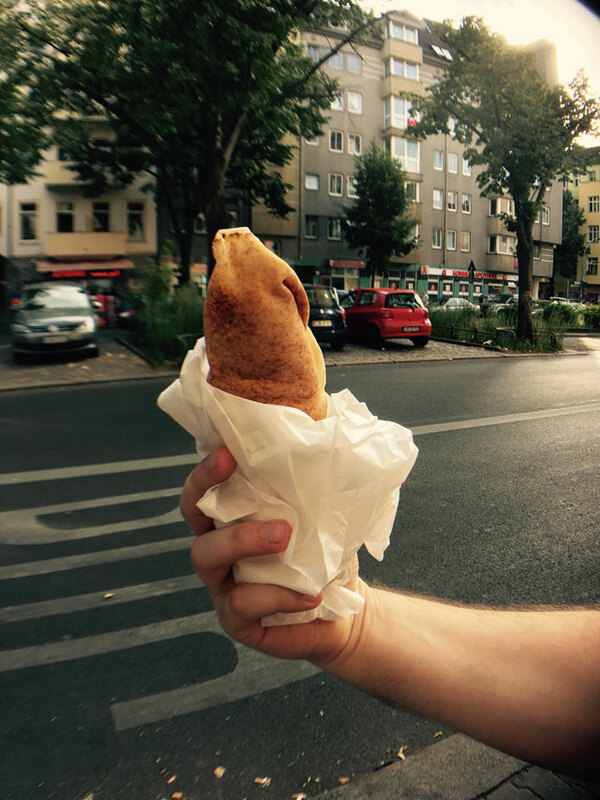 So if you find yourself on Sonnenallee, you now have four great places to try foods loved by the locals. 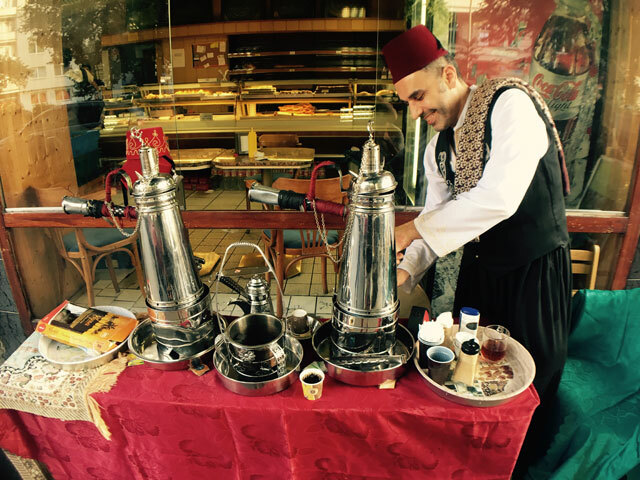 Eat like a local, pay like a local, and maybe contemplate it all with a shisha like a local. You won’t regret it. Damascus born, London raised, Berlin-based. Shoshi is a journalist with a focus on a range of social and political issues. A former broadcast journalist, her interests include food fairs, films, current affairs and space. She showcases day-to-day Berlin life on her Instagram and Blog.